It is important for parents to invest a lot of time and effort during initial stages of a child’s growth. After all, this is the time during which the child forms the basic idea of the world around him and learns basic functions like speaking, walking and so on. 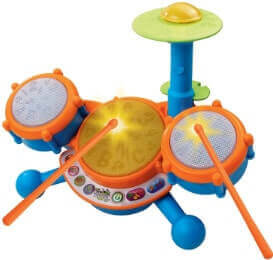 An important step for proper development of a child is selecting the right toys for them. Toys perform two-fold function in child’s development. 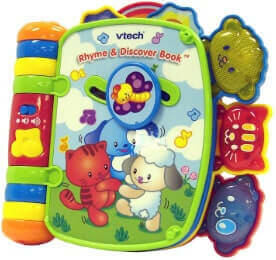 First, toys entertain your child and second, they help to develop educational knowledge. So, it is vital to choose the correct toys for your toddler. So, without much ado, here are some of the best gifts for 2 year olds. 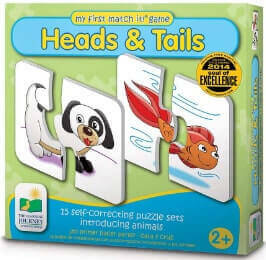 This innovative geometric board puzzle serves as a fun way for the child to learn the fundamental principles of shapes. The simple design will be easy for the child to understand and so would start playing instantly. 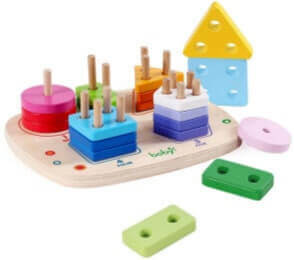 The blocks and the holes would encourage the child to memorize which shape goes where and how many holes each block has and so forth, and so improving memory and hand-eye coordination. So, this is a fantastic gift worth considering for your toddler. A radio controlled race car would be one of the most fun and best gifts for 2 year old boys. Controlling a race car could greatly help the child’s motor skills. The design is attractive and could pique the interest of the child towards the action figures, which could be used to develop a positive attitude towards sportsperson. It could serve as a wonderful way for you to spend time with your child, creating wonderful memories. Whenever selecting gifts for 2 year olds, a couple of things must always be kept in mind – is it easy to understand, is it easy to use, and is it safe. Ideally, a safe toy is one which is large, since toddlers tend to put things in their mouth. 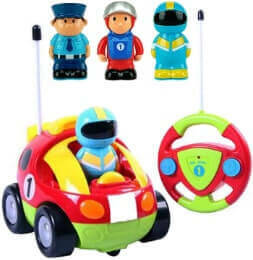 Easy to understand and use are toys with simplistic designs. This is where this drum set excels. As a kid’s drum set, it is large and hassle-free. It can go a long way in creating interest in music. So, undoubtedly, it is one of the best gifts for 2 year old. The See ‘n Say toy is a wonderful way to build your child’s knowledge of the environment around them and encourage curiosity in things they don’t know. This also helps to build their speech abilities. In this particular one, there are a set of animals. It could also provide a platform to teach the child about animals. It helps not only in speech development but also in improving the memory as the child learns to associate a sound of an animal with the animal’s image. One of the most popular gifts, the classic sorting cube offers a much more simplistic and easy to master design than the previously mentioned geometric sort. The sorting cube has a series of shapes and holes through which only certain shapes will go through. It will serve as an easier way for the child to learn about shapes. It will also go a long way in improving hand-eye coordination. 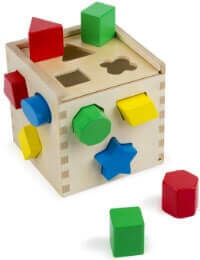 As it has a simplistic design, it would be easy for the child to understand and could play with it himself. Child learns to read with this Rhyme and Discover Book. The book has a button by which it reads out the story. The book by reading out the story, could help the child associate the words with the alphabets and so, learn how to read the story by him/herself. It also helps the toddler to learn new words. A toddler is at a stage where s/he is learning how to walk properly. With the help of sit-to-stand learning walker toy, the toddler would learn to walk at a much faster rate. It could help the toddler in developing finer motor skills and learning to balance him/herself. With the help of this, ideally, the toddler would learn to walk without your assistance, which in turn, would also help the toddler to grow more independent and self-sufficient as well. 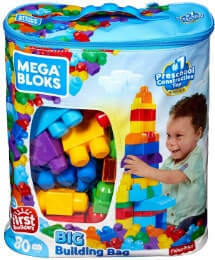 Another classic toy, the building bag has a number of building blocks which the toddler can use to creatively build structures of his/her own choice. Furthermore, it also helps in developing spatial awareness in the child. So, it is one of the best toys for children. It could also provide a platform for parents to play with the child and so, strengthen the bonds. 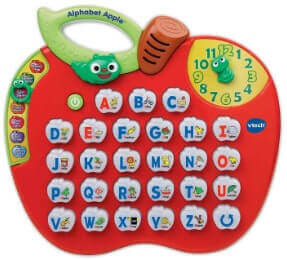 The Alphabet Apple is a large and attractive apple with a number of buttons, pressing which will tell the child what the alphabet sounds like. This could serve as an interesting way for the child to learn the alphabets. As a toddler, it could help in developing the language speaking abilities. 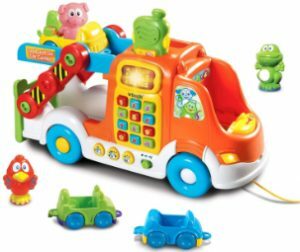 With a rather large and simplistic design, the car carrier is wholesome toy for your child. The car can perform a number of tasks, so, it can keep your child interested and busy for a long time. 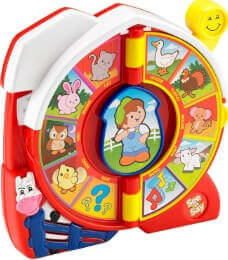 The innovative aspects of this toy are numbers, colors and animals. It can also serve as a platform for the child to role-play with the action figures which would lead to improved creative thinking in the toddler. 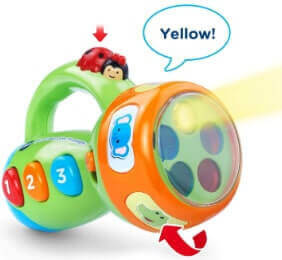 The flashlight is a rather inventive toy which has a number of colors. So, by pressing a particular color button, the flashlight would show that color. It would be a fun new toy for the child to play around with. Furthermore, it could help the child in learning the difference between different colors, which would improve the child’s differentiation ability and basic cognitive skills. It could serve as a memorable toy as it is the child’s first flashlight. The match-it set has two components – a head and a tail. Similar to a puzzle, the set has a number of animals inside. The child is to determine which animal’s head has a particular tail. This could greatly help the child in developing memorizing abilities and learn about various animals. 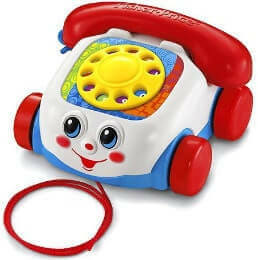 The telephone has a simplistic design which the child can understand easily. It serves as a way to introduce the child to numbers, as pressing a number would lead to the toy announcing it. This would greatly help the child’s memorizing abilities as he will learn to associate a number with a particular sound. Similarly, the telephone also speaks certain phrases inviting the child to initiate a conversation. 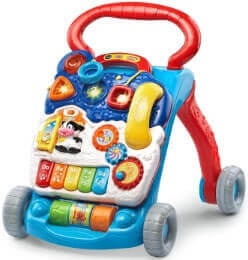 Overall, it is a fantastic toy for a toddler. Often, it is a challenging task for a toddler to be bathed, as they often protest and move around. 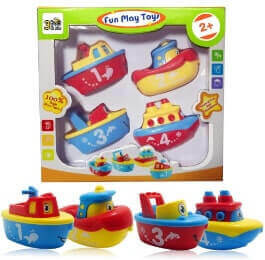 However, when there is a bath toy, the toddler is distracted and involved in playing with the toy, during which time, they can be easily bathed. In this regard, a bath toy is a fun and useful toy. This particular toy has a fun and attractive design which would keep the toddler entertained, and even excited for baths. 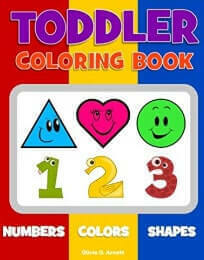 A coloring book is a fun and engaging way for the toddler to explore his creativity. This book has a number of images to color. It can also serve as an opportunity for the child to be taught about the environment around them and teach them what a particular background is supposed to be colored as. It would greatly help in improving their cognitive abilities. So, it is another wonderful gift for the child. Indeed, there are a lot of choices. So, settling on gifts for two year olds is a difficult task, which depends on what you want for your child, and what interests the child. Nonetheless, the toy that the child would grow up with will greatly influence them and they will treasure it for a long time, so think long and hard about which one you want it to be. Most importantly, be creative. Don’t go for a simple toy but rather go for a toy that is attractive, innovative and educational, in some ways. Now go out there and give your toddler the perfect gift.